Let’s talk about home prices again because there have been numerous reports of eroding affordability and fears that we might be topping out just five short years after hitting rock bottom. For example, the National Association of Realtors recently noted that the median existing-home price in February was up 7.7% to $228,400 from a year earlier (February 2016: $212,100), the fastest pace since last January (8.1%). It also marked the 60th consecutive month of year-over-year gains, which if you’re doing the math, is five full years of gains. A month ago, NAR chief economist Lawrence Yun referred to the rapid price appreciation as “concerning” because it was doubling the pace of income growth. Meanwhile, the S&P CoreLogic Case-Shiller U.S. National Home Price NSA Index (I feel like this title needs to be longer) chalked a 5.9% annual gain in January, up from 5.7% a month earlier. The index also hit a 31-month annual return high, which forced Managing Director and Chairman of the Index Committee David M. Blitzer to address affordability concerns. He argued that while higher home prices and mortgage rates may dent affordability and reduce the number of households able to purchase homes, the lack of inventory and strength of the economy means we likely won’t see a change in direction just yet. I think everyone feels the same way, that prices are too darn high, it’s just that no one knows when prices will fall, or by how much. And what the catalyst might be, other than affordability or a lack of willing buyers. Everyone is referring to the current situation as an inventory crisis, with many potential move-up buyers trapped thanks to limited equity and/or a low mortgage rate they don’t want to let go. 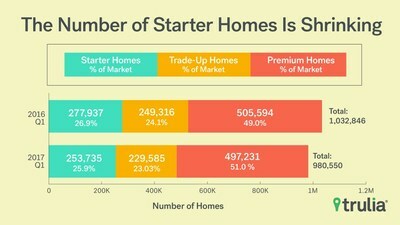 That further limits the supply of starter homes, keeping renters out of the market as they watch home prices creep higher and higher. In fact, Trulia reported that national housing inventory hit its lowest level on record during the first three months of 2017. I believe their data only goes back to 2012 though. Basically, this means the entire housing market ecosystem is out of whack, with no sign of relief anytime soon. Are Home Prices Really Expensive? When you factor in inflation, interest rates, wage growth, etc. To add insult to injury, home prices might not even be that high, assuming you look at “real home prices,” those adjusted for inflation, wage growth, interest rates, etc. The First American Real House Price Index (RHPI) measures single-family home prices after accounting for changes in incomes and interest rates. They use median household income and mortgage rates to determine how much a particular consumer can afford. This allows them to measure house-buying power and in turn affordability. What we wind up with is a very difficult picture than what you might see with other home price charts. For example, real house prices are still 33.3% below their peak seen in July 2006, not that we should measure a healthy market based on that turbulent time. Still, it’s quite a margin. Additionally, real home prices are 10.3% lower than they were in the year 2000. Now can that all change in a hurry? Sure, and it is. In just the past year, real house prices surged by 8.2%. If both mortgage rates and home prices continue to rise, we’ll hit another breaking point soon enough, assuming wage growth can’t keep up. As such, he expects another strong spring home buying season. Or at least lots of interest, despite a lack of inventory.